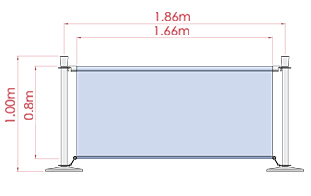 These Market Barriers have 4 Colour Options to Choose From! 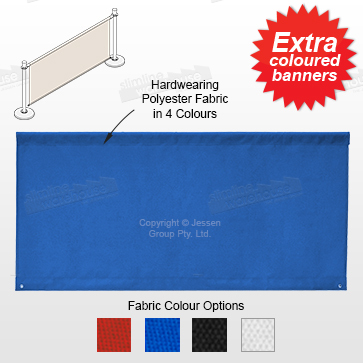 These market barriers are sold as an additional banner for use with our wide range of different cafe banners. The high-quality units are able to be used to switch out colours on an existing unit, or if expanding your configuration to flesh out your entire display! The cafe banners, market barriers are made from polyester fabric for a quality look that fits in with any environment. The hard-wearing banner is able to stand up to the rigors of every day use, even when used in heavily trafficked areas. These units are commonly found in cafes, restaurants, retail stores, exhibition halls, and at outdoor events! There are multiple colours to choose from to allow you to coordinate with your décor with ease. Blue, black, red, and white colour options are all made of the same quality material, with no difference between your choice. These displays are perfect for creating an outdoor seating area with a professional appearance. The coloured banner for cafes have eyelets sewn in the bottom of each banner that will easily attach to our stanchions. A channel in the top of the display can be threaded with the steel bars for a secure display that will help prevent wind from affecting patrons. Order one of these units today for your outdoor venue! Cafe banners can be used outside your business to section off your portion of the pavement, or help contain a crowd at an outdoor event. 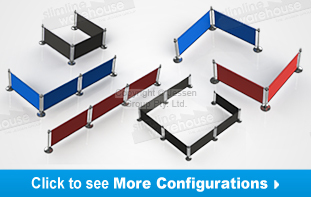 There are many styles & configurations of these displays for you to choose for your needs. Click here to see our online catalogue, which is full of hundreds of products that can be used to outfit your business in style. We add new items almost weekly, helping both our company & customers to stay current with the latest trends & technologies! Slimline Warehouse has been a leading provider of high-quality displays to Australians for over 20 years. Most in stock items at our warehouse will despatch same day when purchased by 1pm EST! Purchase for your business today in Sydney, Melbourne, Perth, Adelaide, Brisbane, Cairns, Gold Coast, Hobart, Bendigo, & anywhere else in Australia!